Tim Summers studied music at St Catherine's College, Oxford, before completing an MPhil at Bristol University. He is now writing a PhD on video game music. Dieser Artikel nähert sich dem Gegenstand Computerspielmusik über einen genre-basierten Ansatz, wobei davon ausgegangen wird, dass zwei für Computerspiele genrespezifischen Ebenen in der Musik wirksam sind: das interaktive Genre (der Spieltypus/interaktive Mechanismus) und das umgebungsbedingte Genre (das Setting des Spiels). Die Interaktion zwischen diesen beiden Ebenen erzeugt die Musik des Spiels. Untersucht man Spiele innerhalb desselben interaktiven Genres, selbst wenn das umgebungsbedingte Genre deutlich unterschiedlich ist, können wir ähnliche Beziehungen, Funktionen und Methodologien von Computerspielmusik aufdecken. Drei interaktive Genres werden im vorliegenden Artikel kurz genauer betrachtet (survival horror games, strategy games, fighting games), um zu veranschaulichen, wie die musikstrategischen Ähnlichkeiten die Spielgenres durchweben. This article proposes a particular approach to video game music by advocating a genre-based enquiry. Two generic levels are active in video game music: "interactive genre" (the type of game/interactive mechanism) and "environmental genre” (the "setting" of the game). The interaction between these levels produces the game's music. By examining games within the same interactive genre, even if the environmental genre is markedly different, we can begin to uncover similar concerns, functions and methodologies of game music. Three interactive genres are briefly examined (survival horror games, strategy games, fighting games), in order to demonstrate how musical-strategic similarities can be seen to weave through game genres. In this article I propose an approach to video game music that prioritizes the player's interaction with the game.1 Just as Kevin J. Donnelly has discussed film/television music with respect to its relevance to the audience, so I wish to consider game music in relation to the player.2 First, I will outline the core concept of a genre- and player-centered method of examining game music, before briefly exploring a few examples to illustrate (with a variety of game- and genre-appropriate methods) the way in which this construct functions in application. In video game scholarship the video game genre has frequently been addressed. Evolutionary or biological analogies seem to be especially favored: "The Origin of Species,"3 "A Natural History of Videogames: Phylogeny,"4 "A Zoology of Gaming. "5 Authors outline broad categories (species) of games and emphasize the historical development within these distinct genres.6 Not all scholars use identical genre categories, but the Darwinian overtones and the stability of genres (as paradoxical as this might seem) are recurring themes in the literature. Even hybrid games that blend genres are considered distinct fusions of two (or more) elements. One only needs to open a video game magazine to observe the community's own prioritization of genre: standard abbreviations are used to inform the reader of the format of gameplay in any one game based on the genre into which it falls. For example, a game labelled "FPS," an abbreviation for "First Person Shooter," would describe a game whose main objective is to travel through levels, eliminating enemies using firearms, with the gameplay screen representing a fixed, first-person viewpoint with the selected weapon in view. Such genre descriptions are used to communicate what is expected of the player and what is the nature of the interactive mechanism. This consciousness of genre can end up in groupings of serious gamers defining themselves by the types of games they specialize in playing. It is believed that the main genres are sufficiently different from one another that direct comparison across generic boundaries would be inappropriate. Duncan here fuses two types of generic levels in the term "medieval role playing type" game: the "medieval" element and the "role playing type." One level describes the type of game; the other, the environmental setting (the "interactive genre" and the "environmental genre" respectively). In order to illustrate clearly these two different generic issues, let us take an example of games based on films. George Lucas's Star Wars film series is an example of films that belong firmly within the science-fiction genre. LucasArts has used the Star Wars universe depicted by the films as the basis of many games, and, significantly, of many different types of games. Star Wars has produced first-person shooters (Dark Forces, LucasArts 1995), adventure games (Shadows of the Empire, LucasArts 1996), role-playing games (Knights of the Old Republic, BioWare/LucasArts 2003), an online role-playing game (Galaxies, Sony/LucasArts 2003), racing games (Episode I Racer, LucasArts 1999), platform games (Star Wars, Namco 1987), flying simulation games (X-Wing, Totally Games/LucasArts 1993), puzzle games (Puzzle Blaster, THQ 2005), a fighting game (Masters of Teräs Käsi, LucasArts 1997), strategy games (Empire at War, Petroglyph/LucasArts 2006), educational games (Droidworks, Lucas Learning 1998), and even a chess game (Star Wars Chess, Software Toolworks/LucasArts 1994). Each of these sometimes extremely different games is cast in a science fiction mold, but this does not determine the function of the music in the way that the type of game does. Both factors, however, affect the music produced for the game media. This dynamic interaction between what we might label the "interactive genre" and the "environmental genre" serves to produce the music for the game. The genre theory is similar to the way in which games are constructed. Rather than programming every game from first principles, developers produce "engines," which create the architecture of programs and also influence the gameplay: in effect, a program for programming games. Although the types of game engines vary greatly, a typical engine might contain components for generating 3D/2D graphics and textures, including the calculation of in-game physics, artificial intelligence, and technical elements such as memory management. Engines can include, or be specifically dedicated to, the programming of sound and music. The engine does not create the content of sounds or art, but provides the framework for these to be used in the game. Just as an artist can design a texture that the engine will apply to a surface, so a musician can create music. The (music) engine starts, stops, and changes this music, as and when appropriate, depending on the gameplay. Engines are adaptable and often have long legacies. For example, the engine id Tech 3, developed by id Software for Quake III Arena (1999), was later used in many different First Person Shooter games, with many different settings, from historical conflict (Call of Duty, Infinity Ward/Activision 2003) to fantastic alien worlds (Quake), present-day environments (James Bond 007: Agent Under Fire, EA 2001), or well-known franchise universes (Star Trek: Voyager – Elite Force, Raven/Activision 2000). Utilizing the same underlying framework, these games are all relatively similar in gameplay experience, even though some are deemed to be of higher quality than others. 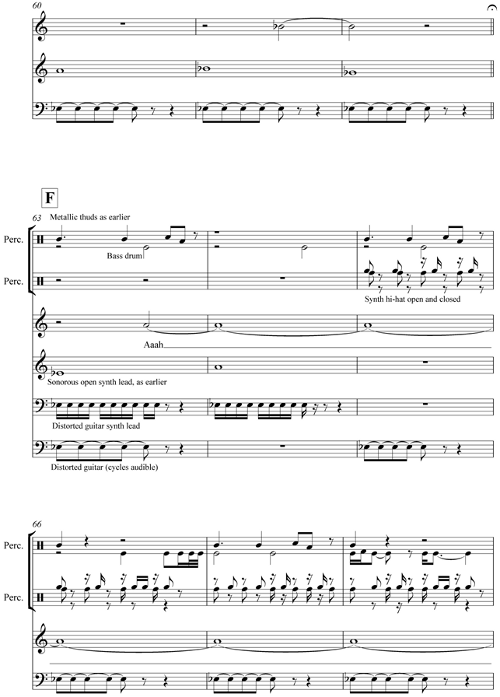 I have chosen to base the discussion of player perception on the musical game texts, focussing on the way in which the music teaches the player to hear the scores (i.e., how music constructs the act of listening). I consider the player an actively investigative, though malleable, perceiver who is reading the game. Such treatment of the player ties in with Gee's concept of video games as sites of active and critical learning.15 Music is part of the "semiotic domains" of games in which players become literate.16 Since game genres represent individual semiotic domains,17 different traditions of (game music) literacy and player-interpretation are taught. As part of becoming familiar with the "design grammars" of game genres,18 players become literate in the musical functions of music in games. Using Gee's terms then, we can describe a core element of genre-centered analysis as advocated here as including the recognition, definition, and investigation of the musical design grammars that belong to the generic semiotic domains. Divisions of genre should not be prohibitively strict. Zach Wahlen warns against creating "inappropriately rigid taxonomies which fail to account for the full expressive potential"19 of video games. Thus, an element of multidimensionality as well as non-exclusive, multiple perspectives are imperative in any theoretical framework for dealing with game audio. Game genre is evolving and adaptive. The analysis must feature these same qualities. As observed above, game music is not exclusively determined by the game's interactive genre: like the interaction and fusion of the game engine with the content, so the interaction and fusion of genre in the interactive sense and genre in the environmental sense produce the music. By creating new perspectives, new ways of categorizing, and redrawing generic boundaries time and time again, we can begin to discover the common and recurring features of game audio: the overarching methodologies and strategies, the differential behind the function, and the engine behind the content. A survival horror game gives the player control of a character and challenges him to navigate an environment infested with demonic creatures (the genre borrows many tropes and clichés from the horror film). As well as defeating the undead, the player is usually asked to solve puzzles: matching keys to doors, accessing hidden areas, solving time-based puzzles, and so on. The player is constantly venturing into unknown situations and environments. Unlike a film, the unity of player and character-consciousness requires the player to be kept in the dark as much as the character. Constraint of player knowledge is a key genre dynamic; thus, the player is highly attuned to receiving as much information as the game is willing to give, a large amount of which comes from the music. Dynamic scores are common in this genre,20 actively communicating with the player, who will consciously interpret the music. Along with "creating atmosphere," musical narration is important in other ways. Music situates and elaborates on the visual dimension through sonic environments and musical semiotics. The music is established as a knowledgeable entity, almost representative of the game's consciousness; it knows far more than the player, to whom it generously conveys information. Let us consider an example in detail and relate the function of music to the nature of the survival horror game. In Alone in the Dark 4 (Darkworks/Infogrames, 2001), Carnby (the hero) begins the game by journeying through the grounds of a haunted house. 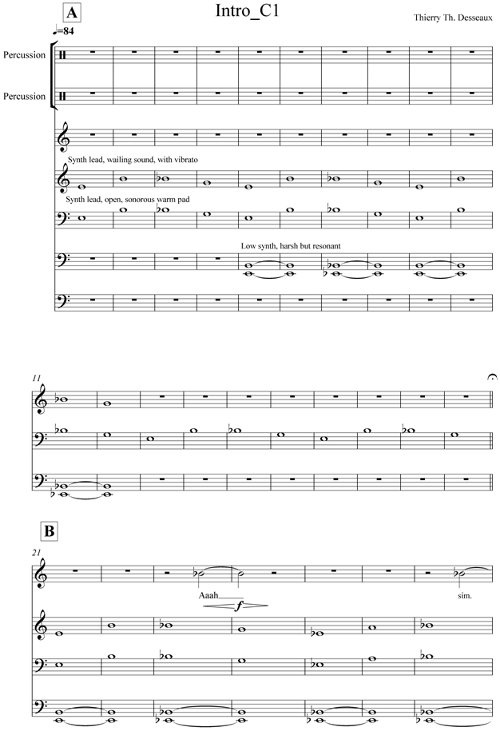 Figure 1 (see appendix) shows the composer's implementation sketch for this first level, and figure 2 (see appendix) is a transcription of the area's music. In the following the numbers refer to the marks on the computer's sketch (invisible trigger-points in the level), while the cues in capital letters are my own additions. The game is seen through static camera viewpoints, which change depending on the location of the character in the environment. This allows the music to be synchronized to the changing viewpoints as well as with particular in-game events. At number 1, the cue fades in as Carnby walks toward the house, indicating to the player which path to follow. Cue A introduces the level's ostinato. On first presentation, the music sounds as if it is in E minor, with a tritone chromatic addition, but already on a second playing, the added accompaniment begins to challenge that assumption with the division of the phrase into an unsettling modulating motion, implying E-flat major. Because the pitch is low, it is difficult to identify it accurately, and the semitone changes can seem to be a sleight-of-hand trick. Like the images of ghosts that seem to appear in momentary flashes of lightning, does that harmonic shift really occur? When the later statements of the ostinato are stripped of their harmonic support, the sound is heavy with vibrato and sounds like the voice of a frightened being, unsteady and insecure in tone (mm. 13–20). To avoid monotony, the music will fade out if the player does not pass a trigger point within a certain time limit. When the player enters a sub-area, the circular hut, the music fades out to allow a cutscene to ensue, restarting when the player exits the hut and redoubling the sense of foreboding, thereby tying the music to the environment. As the player approaches a locked door (7), cue B creates a sense of unease. When the ostinato begins again, the listener could find this familiarity comforting, but the startling, growling "aah" voice that sweeps between stereo channels is disturbing: Is this voice diegetic?21 Whose heartbeat do we now begin to hear? The distorted guitar's audible cycles reveal the underlying pulse of the ostinato, as this industrial respectively mechanical sound enters the soundscape.22 Like an illusionist's misdirection, these sonic additions distract from the alteration of the ostinato. The move to E-flat (m. 25) has already been prepared by the bass accompaniment, so it is only through the newly-dissonant tritone A (which thwarts a stable E-flat major tonality, clashing with E-flat and B-flat) that the listener would overtly hear that a change has taken place – and wonder when this musical slip occurred. The secure periodicity of the cue is undermined with the addition of an extra note to the ostinato. The composer is creating an unsettling, dynamic musical canvas, which helps to construct a sonic environment that is perturbing. You cannot trust your eyes, and you cannot trust your ears. Walking through the door triggers a cutscene of a monster attacking guard dogs, accompanied by a looped, heartbeat sound, cue C (introduced earlier). The diegetic puzzle is unsolvable: if this is the monster's heartbeat, why have we heard it previously, and why does it persist after the creature is killed? Is it Carnby's heart, curiously prominent when he is remote or unseen (as here), sonically binding the player to the hero? Does this pervasive heartbeat perhaps represent some organic evil woven into the haunted location? After the cutscene, cue D (m. 32) is the most aurally abrasive cue yet, reflecting the horrific cutscene, and indicates that we are getting closer to the supernatural entities. This cue also propels the player onward with the promise of excitement, despite the fear. Player-propulsion is illustrated with the use of music to imply narrative development; if the player does not release the chained Rottweilers, then the musical elements of the ostinato and vocal screech are heard. Once completed, these disappear from the soundscape, unless the player returns to this area. The overall style of the soundscape is morphing as the player progresses: the increasing prominence of percussive elements and grinding metallic sounds are moving away from the more naturalistic sonorous sounds featured at the start of the level. As we come closer to the supernatural, we lose touch with the outside, normal, organic world. When Carnby reaches the top of the steps, he is attacked by dogs (m. 40). This passage is not only a "stinger" for the assault, but also is required for sonic contrast. When the character walks around the side of the quad, an unsettling silence descends on the soundtrack. The player anxiously anticipates the score's reintroduction. Sure enough, the music returns, more intense than ever (m. 52, cue E), when the player triggers the appearance of more dogs who attack the hero. When the dogs have been dispatched, the musical state changes to looping mm. 59–62, with reduced textural activity. As unsettling as this music is, the player now has a different relationship with the score: the narrative voice is not silent and reassures the player by relating the level of anxiety he or she should be feeling. Even if the player retraces his/her steps and again crosses the trigger for the dogs, the music system quickly segues into the less-active passage. With the appearance of the additional Rottweiler on the stairs at number 10, the musical system does not react, rendering the musical narrative voice untrustworthy and unreliable. Marker 10 (cue F), located on the steps up to the terrace, prompts the transformation of musical elements: the screech changes pitch and is heard sustained (trapped?). The ostinato evaporates in mid-statement, abandoning the percussion elements, which seeming to be constant, yet change subtly to avoid boredom/predictability. The "g" trigger produces another example of the removal of sonic elements to great effect: by stopping the distorted guitar, the soundscape suddenly feels to be without any foundation. The introduction of the heartbeat is emblematic of the anxiety this produces. 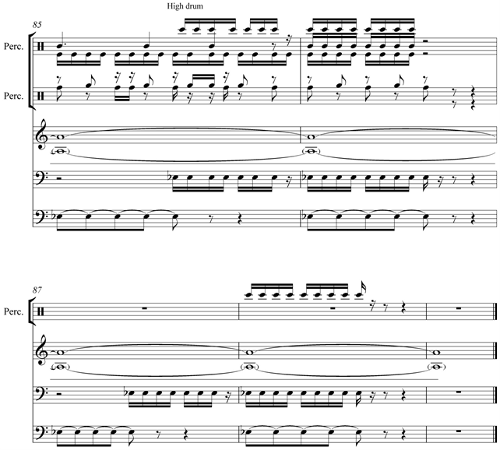 For a cutscene that takes place on the steps of the main gates, the score is reduced to light drums and the heartbeat (m. 75). Moving further along the terrace, we suddenly switch to viewing Carnby from inside the house through a window, accompanied by the unsourced heartbeat (cue C). If Carnby retraces his steps, this moment is not repeated. The musical and narrative climax of the level occurs as Carnby faces the monster at 12, cue G. Once the monster is dead or Carnby moves beyond 13, the music fades out in preparation for the next chapter. Even in this short level, music communicates with the player, creates "atmosphere" by constructing the environment, unsettles the player using an arsenal of musical techniques, generates horrific reactions to the supernatural monsters, provides a creeping sense of unrest with what the player hears as apparently organized, yet unpredictable sounds/sonic procedures, and creates a dynamic, reactive environment in order to captivate the player. The features of spatiality, communication, dissonance, constraint, indeterminacy, anxiety, and tension are all fundamental to the survival horror's use of music to construct the game experience. In the example just discussed, the music is anchored to the locations and environments within the level, and the music is used overtly and subtly to communicate with the player. We find here a timbral dissonance between juxtaposed aesthetics (a sonorous pad against aggressive drums and industrial grinding) and harmonic dissonance (an A/E-flat tritone in the latter half of the level). The constraint is evident not only in the limited musical elements in play at any one time, but also in the heavy emphasis on repetition. This constraint is used for unsettling ends as changes to repetition patterns are hidden, so only retrospectively will the player realize that an alteration has occurred. The dynamic implementation system brings with it a certain amount of indeterminacy, since the player's actions create the musical soundtrack through the act of playing – the full musical output is not completely predictable (even if the dynamic markers are known). The use of silence creates anxiety and tension: it is unsettling in the (paradoxically) surrealist absence of the safety of music. The player knows that the music will return, in all likelihood prompted by a particular event. He or she does not, however, know exactly when this will happen (at least, not on the first play-through). In addition, unsettling sounds such as screeches and mechanical noise help to create anxiety through the aural alienness and abrasiveness of the soundtrack. Alone in the Dark 4 shares many musical procedures with other survival horror games, such as Silent Hill (Konami, 1999), which similarly uses silence to unsettle the player and contains an unreliable musical narrator.23 Silent Hill also uses industrial grinding sounds in a repetitive, minimalistic fashion, evoking the traditional sonic depiction of hell.24 Games from the Resident Evil series (Capcom) usually trigger music based on location and provide a sense of progression through an environment with a timbrally-evolving score as well as with enemy-triggered cues. Survival horror games are generally more similar to earlier horror film-scoring techniques than to attempts in recent films to subvert musical conventions. For example, anempathetic scoring (music remaining indifferent to diegetic activity) is rare, since the central game mechanism requires the player to empathize and identify with one particular character. Similarly, game scores have to demonize the supernatural elements in order to validate the player's plight, to assure them that he/she is morally right, and to monumentalize the playing of the game as a worthy endeavor, an effort that holds the promise of achievement. No sympathetic or ambivalent scoring of villains is appropriate here. Destabilization through atonality is ubiquitous in the survival horror game, such as in the increasing "infestation" of atonality in Resident Evil's mansion. Music itself can clearly become a "demonic" presence in media, embodying horror,25 as well as ritualistically invoking film demons, as aptly illustrated by the layers of aleatoric music and extended instrumental techniques taken from twentieth-century experimental avant-garde works in Dead Space (EA, 2008). These layers are mixed in real time by the engine, depending on the player's proximity to aliens and other sources of fear in the game. In games, the musical demon exists not only to possess the player over the head of the diegesis, but also to possess the diegetic character through the player. We have seen our "demon" as a narrator, a guide, a companion, an assistant, an unreliable trickster, and sometimes all of these things simultaneously. The term "possession" is appealing, although in the video game, the relationship is more dynamic and interactive. The same compulsion and effectiveness of film may be felt by the player, but in this game medium, we get to dance with our demon. Strategy games do not usually provide the players with an avatar, but instead give them a top-down or isometric viewpoint over a wide playing field, with the ability to command their "owned" elements in the gameworld. Strategy games have their ancestry in board games, with gameplay often characterized by a long-breathed pace. Kristine Jørgensen identifies two strands of audio function in a strategy game: alerting and communicating information to the player, and the emotional involvement of the gamer.26 Although Jørgensen does not consider music directly, we can observe the same features she describes in the music of strategy games. In Dune II (Westwood/Virgin, 1992), set in Frank Herbert's Dune universe, music communicates information and changes in the game state to the player, even if the player is not viewing the object concerned. From the woodblock-like strikes that indicate the spending of credits to the fanfare that plays when an enemy unit is defeated, these musical sound effects also prompt the player for a response. Along with these fragments, a dynamic underscore plays continuously. In Dune II, the player faces threats from rival armies and sandworms. These occurrences require immediate and drastic action. Along with other key events, such as winning the level, these occurrences cause changes on the level of the musical underscore. Cues in the non-alert underscore encourage the player to progress, while providing a sense of foreboding about the unknown alien landscape. 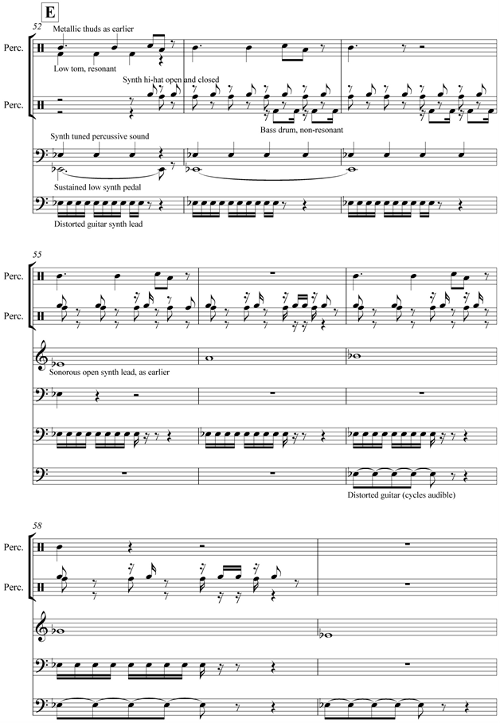 These (often pointillistic) cues feature disparate musical elements with a great registral distance between them, such as a high glockenspiel with a low synthesizer pedal pitch. Timbres also contrast, from orchestral-emulative to synthesized, from metallic to organic, and clear to murky and ill-defined. A threat lurks in these soundscapes as quiet synthesizers and guitar parts form an ominous presence in the texture. The percussion is insistent, a motoric impulse that propels the player to explore. Ostinati generate a slowly-evolving musical fabric that is neither static nor ostentatious. Most of these cues feature a chorale-like section, providing a contrast to the layered ostinato texture. Exploration cues may be halted at any moment, to be replaced by an alert cue. Musically, this change consists of a significant increase in tempo, the introduction of prominent militaristic percussion, a solid minor key, harsh synthesizer timbres (angular waveforms), insistent eighth-note repetition and fanfare-like figures in brass tones. The dense texture of the alert cues contrasts with the sparse exploration cues: the unrealized threat is displaced by a specific and immediate danger. With a selection of cues for each purpose, the player recognizes not so much the particular pieces, but the musical features and contrasts. The music of Dune II also involves the player emotionally. The music makes the planet real through sound: it immerses the player in this barren, alien landscape. Using sounds that do not emulate orchestral instruments, but are technological and harsh, the score evokes a sterile and futuristic environment, with disquiet produced by the unsettling, changing pedal notes. Outside times of engaged combat, the soundscapes are sparse, emphasizing the planet's isolation. The sudden dynamic changes (and the anxiety of possible change) generate tension. In the attack cues, grandiose "space opera" gestures by the symphonic brass and strings make a sonic tie to other science fiction media, contextualizing the premise and the setting. The chorales evoke the mystic elements of the planet. The whole soundtrack is unified, both in style and sometimes motivically (with the "advice" screen theme appearing in an attack cue in rhythmic diminution). Alpha Centauri (Firaxis/EA, 1999) allows the player to control one of seven factions, each with a distinct identity, which demands that the player tailors a playing strategy to each group's strength. A different set of samples is used for the background music depending on the faction chosen, reminding the player of the priorities and identity in role-playing as the faction leader. Straightforward musical signifiers are used: the playing of religious fundamentalists prompts religioso chorale samples with synthesized bell sounds; the music for environmentalists contains a suitably "organic," sonorous, morphing synthesizer pad in a non-angular wave, while the cold, authoritarian, militaristic group uses waterphones, metallic/industrial clangs, and string-like scraping sounds. Similarly, Command & Conquer 4 (EA, 2010) gives each of its two controllable forces a distinct musical soundworld. The terrorist group is musically "othered" through electronically manipulated instruments, texts sung in a language other than English, and unusual percussion. Playing in this group is an opportunity for the player to "go othering" in contrast to the non-synthesized orchestral palette of the opponent, the so-called Global Defense Initiative (GDI). The game emphasizes plot and storyline in the strategy game. Particular character-motifs are applied in cutscenes, which are then heard during the main gameplay itself, reminding the player of the background plot and making the battle more significant as a result of the contextualization. This in-battle music is closely dynamic, reacting both to small-scale fighting (beginning and cessation) and outright victory. Historical strategy games, such as Age of Empires III (Ensemble/Microsoft, 2005), can take place over long periods of implied historical time. 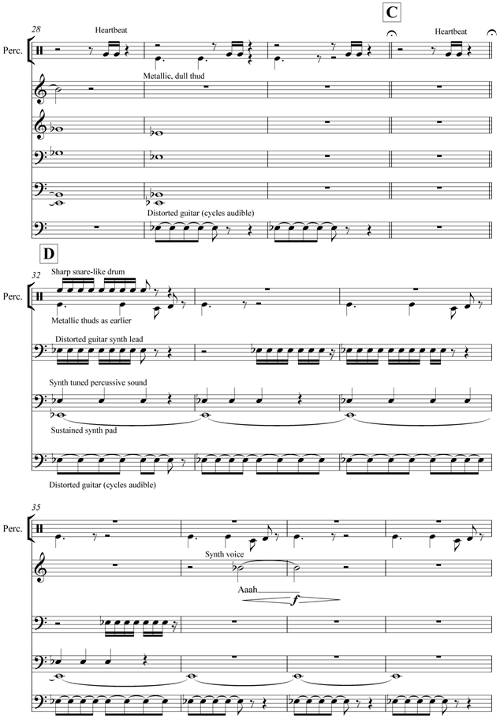 Using musical alerts (a fanfare rings out when combat begins, while a lower-string ascending scale punctuated by a drum and tubular bell indicates that a new import shipment is available), the game's music narrativizes the founding of America, with thematic material recurring though different stages of colonization. This provides an overarching sense of continuity to the game, emphasizing the progression of societies whose identity is asserted through repetition. The "Hollywood" style is appropriate for such narrativizing: mythologizing America is a common theme in American films. Simultaneously, the dynamic implementation of the music reflects the intensity of combat and signifies the onset of the battle. Games set in historical eras generally relegate contemporary music to mere local color in the non-diegetic underscore, with a Hollywood-based musical language preferred. Given that game music requires the player to interpret musical signification rapidly and that gamers would find it difficult to interpret the musical semiotics of truly contemporary (or authentic) music, a musical language is used instead with which the players are fluent. In Rome: Total War (The Creative Assembly/Activision, 2004), Hans Zimmer's Gladiator score appears to be a clear inspiration (particularly in the wailing vocalizations, guitars, and low drum parts). The battlefield music changes with the battles. 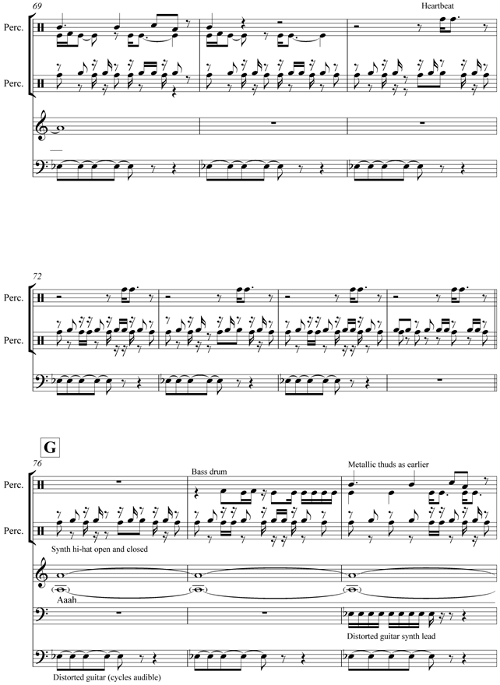 Consider the excerpt from the game's music code in figure 3 (see appendix). The code describes three battle states (tension, mobilizing, battle) and commands the game to play the assigned cues in each case (.mp3 files). As might be expected, the spectrum of "tension" to "battle" translates into an increase of tempo, rhythmic density, and musical dynamics, with the escalating prominence of percussion instruments (particularly drums and cymbals), cuivré brass, tutti passages, incisive con forza lower strings in rhythmic patterns on repeated notes, and homophonic choral voices with improvisations by female soloists. Some reference to ancient Greek and Roman instruments is featured in the use of horns and a kithara-like instrument. Civilization IV (Firaxis/2K Games, 2005) includes a distinctive leitmotif for each national leader: the Song of the Volga Boatman for Peter the Great and Stalin, Malagueña for Isabella of Castille, Domenico Scarlatti's Sonata in E K.380 for Louis XIV, and so on. With each "era," the anthem theme is heard in varying degrees of fragmentation and in different instrumentation; as the civilization grows and prospers, the associated music mirrors this transformation by changing to a version of the theme that is more fully orchestrated, stronger, and more melodically complete. Along with being heard on the diplomatic screens, this music is also heard diegetically emitted by the leader's "owned" cities, allowing the player instantly to assess the state of the gameworld through sound. The players colonize the world sonically as they conquer geographically, binding together different modes and views of the game. Non-diegetic Western art music that is appropriate to the "era" of gameplay is heard when the player's viewpoint is at a middle-distance zoom. Music is used as a global marker of the development of the eras of civilization: it communicates the world's social and technological development and implicitly narrates this evolution to the player. The non-diegetic score functions as a sort of musical-historical education, linking the real world and the simulated world, keeping players engaged in the game media when they zoom away from the ground. Music in games is designed to make the media more compelling. In strategy games, this occurs by drawing in the player to a deeper engagement with the diegetic world. Much of the musical language (particularly in the use of timbre) is dedicated to construction: the music realizes the world. Dynamic music is concerned with the player's changing relationship with the game: music that describes an event is significant in that it requires a response from the gamer, a response that is musically expressed and communicated. Along with bringing the player and the simulated world closer together, the response also empowers players by giving them with the ability to change the music through their actions. The remote viewpoint in the strategy game can potentially inhibit player immersion and articulation of dramatic storylines. Music is useful for characterizing plots and characters (as well as worlds) and using these to link cutscenes and the main strategy gameplay. Similarly, with historical games, music helps to contextualize and build a role for the player. Strategy games are designed to be played for a long period of time; music can be used to structure this considerable duration, both with thematic strategies and by providing a coherent, yet changing sound world. Since their inception, fighting games have changed little in format. From a side-facing perspective, two characters fight until one character's health value meter reaches zero or a time limit expires. Game characters vary considerably, although they are usually humanoid in form or appearance, and while weapons are introduced from time to time, the emphasis is on martial-arts style hand-to-hand combat. The main attraction of this genre comes from playing against other humans. Fighting games are popular in arcades as "social" games. The fighting game expert will have spent enough time with the game to know exactly which attacks to initiate at any one time – a kind of virtuosic player. With no random commands, this player will block attacks, reverse moves, and understand the strengths and weaknesses of a particular character and its opponent. In a well-produced game, the roster of characters will be individualized and balanced through their different abilities, strengths, and weaknesses. Signature moves, attacks, and superpowers will differentiate fighters. Sequels are popular in this genre, as players can reunite with characters to discover their favorite avatar in higher resolution and with both new and familiar moves. Music in fighting games is near-continuous: the audio should involve the player in the combat, and, most importantly, with their chosen character, for it is in this selection that the key to mastering the game is held. Characters are often differentiated by their country of origin, each being associated with a particular home "stage" (backdrop). The audio in fighting games typically uses long stretches of music, which do not react to the progress of the fight, although the tempo will often increase during the final moments for the sake of dramatic climax. As is usual for fighting games, the music during the game rounds in Street Fighter II (Capcom, 1991) consists of an opening cue that segues into a main theme, which is looped until the health meter of one player reaches a critical point, whereupon the tempo accelerates, and a finishing cue concludes the level. The game's characters are based on national identities and given individual themes that rely on appropriate national musical stereotypes: the Spanish bullfighter's theme uses castanet sounds, flamenco rhythms, and a melody that evokes the ornamented trumpet of traditional Spanish music, while the Chinese martial artist has a repetitive pentatonic motif played in parallel fourth, invoking the "Oriental" stereotype. The Indian character is accompanied by a parody of bangla sounds, and the Brazilian, by Latin rhythms. It is the characters rather than the locations that are delineated in Street Fighter II, since multiple characters from the same country are each given different themes. When individualization is important and graphical technology limited, music and musical stereotypes are a useful (if morally questionable) method of defining these characters. In Street Fighter IV (2008), many characters return, and since music is such an important part of their identities, their attendant themes must also return. Thanks to modern technology, the characters look very different from their original incarnations. The themes help to identify the fighters as the same ones met in the earlier game, while simultaneously expressing the evolution of the character. The newer game does not employ musical clichés as often as did the 1991 soundtrack. There may be two main reasons for this: first, using clichés in this manner in the newer games might be considered inappropriate (possibly with an awareness of political issues). Second, the musical emphasis is now on trading on the character as already constructed, as an individual (with which the player is familiar), rather than as a function of the racist/nationalist stereotype that was initially invoked to distinguish the character. The "international" elements are muted and integrated into the all-pervading techno/orchestral style. The theme for the Chinese martial artist buries the parallel-fourth part deep inside a techno-orchestral texture, using string interjections with a drum track. The main melodic theme returns, but now performed by a Chinese flute and string instrument and with more "authenticity" by using realistic sounds and pitch-bends appropriate to Chinese music. 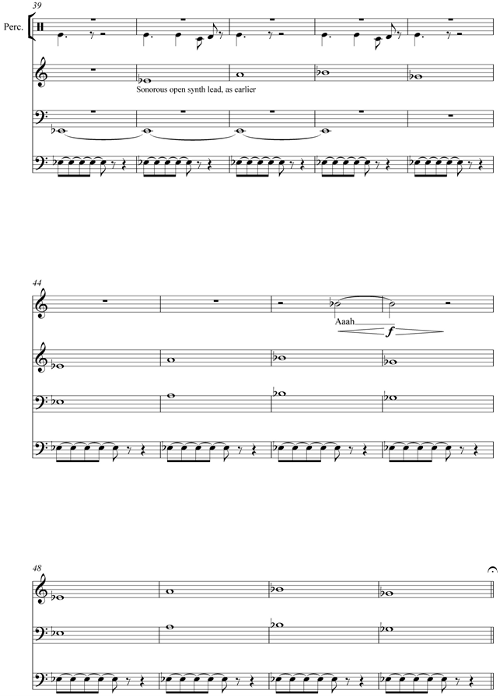 The Brazilian's theme has melodic recurrence, but the characteristic rhythms are not reprised, and the bangla approximation has been considerably toned down, being heard only in the light drumming that accompanies an augmented version of the theme. Street Fighter IV reveals its emphasis on character storylines by including two "versus" themes, in which particular fights are scored between major characters. Perhaps this might indicate the need to use music to open up the aesthetic focus – to storylines and narrative beyond the immediate characters, with a self-consciousness that betrays neither narrowmindedness nor overtly insensitive musical Orientalism. The different styles of fighting games are articulated musically. Virtua Fighter (Sega, 1993) aims for realistic combat and authentic fighting styles, while Mortal Kombat (Midway, 1992) features comic hyper-violence (such as decapitations) and fantastic elements such as conjuring fireballs. Mortal Kombat features dark timbres – low bass pad sounds, heavy (often wooden-timbred) drums, and an emphasis on minor and pentatonic harmonies. Higher sounds generally play angular parts, occasionally using detuning effects. With no cheerful melodic themes, this is a gloomy, grungy world. By contrast, Virtua Fighter has syncopated rhythms, salsa-influenced "brass" parts, bright melodies in glockenspiel-like tones, secure harmonic and tonal areas, all with a tropical disposition. While electric guitars are featured occasionally, 80s electro-pop is never more than a stylistic half-step away. Nintendo has created light-hearted fighting games featuring its already well-known characters and environment, which have become popular from long-running game franchises. This is the central appeal of the games, and the music has to emphasize this element. Super Smash Bros. (Nintendo, 1999) recreates the attendant audio paraphernalia bound up with the characters. Each character has a "home" stage based on an environment from games in which the fighter has previously appeared. The characters are treated as part of the environments (here because they belong to the same franchise worlds). Music from each game being alluded to is recreated. Original compositions for the final "bosses" reveal a trend for musical (possibly narrative) emphasis toward the end of the game: we are in "unknown" territory, since this music is not taken from previous games (and thus is not recognized, as would be the case in earlier rounds). For Super Smash Bros. Brawl (2008), Nintendo assembled thirty-eight composers to create the soundtrack, many rearranging their own music from earlier games. The game features multiple tracks for long-running franchise characters with flexible music selections so players can apply music that is associated with the incarnation of the character with which they are most familiar. The stylistic variety of the score is enormous, yet whether playing is accompanied by the choir and solo vocal parts for the Fire Emblem theme, the intense heavy techno of the F-Zero racetrack, the driving rock for Sonic the Hedgehog, the bleeps from the 1980s "Game and Watch" Nintendo handheld consoles serving as the basis of a music track, or the Latin rhythmic casting of the Super Mario Bros. theme, the player feels a unity of purpose and tone. Unlike Street Fighter, however, this stylistic variety is different from musical stereotyping. The game is already dealing with well-established characters, so it does not need to rely on such a crutch to define them. The music used in the game is unified through the concept of pre-existing games as musical sources. As in the later Street Fighter games, the player encounters characters that had previously been seen in much lower resolution: the music is emblematic of the newest incarnation of the characters, at once newly rendered, yet the same characters that have been drawn from older media. The music of Brawl demonstrates clearly the aims of musical functioning in the fighting game. The score acts as part of the identity of the characters and locations used in the game, uniting those same characters and locations. The music in Brawl proceeds at a fast tempo (as is universally required for fighting games), and the tone is weighty enough to make its aesthetic presence felt, yet without descending into melodramatic scoring, keeping the fun and light-hearted self-referential humour at the forefront of the music. Musical evolution through technological eras is clearly illustrated in this game as the music from earlier games is re-created, often using live performers, in a kind of self-celebratory manner. The techno-orchestral music of 2000s fighting games is kept to a minimum, possibly to avoid generic clichés: this is a game that strains not to be a "typical" fighting game, and the use of such musical resources helps to distinguish the game from its competitors in a homogenous game genre. While the examples discussed in this article are necessarily brief, it is hoped that they have revealed the potential of a genre-focused approach to video game music as a flexible and yet coherent construct. It is possible to reveal the mechanisms, purpose, and function of game music in this way, even with a view to assessing the effectiveness of a particular strategy. While music between games in the same interactive genre may differ radically in articulation and aesthetic style, the priorities for the game's music and the way in which it must function within the game and vis-à-vis the listener remain similar. By uncovering the importance of the music to the player, we can begin to understand the "human factor" in game music. With millions of pairs of ears attuned to this dynamic, interactive media form, it is high time for musicologists to begin playing the same game. 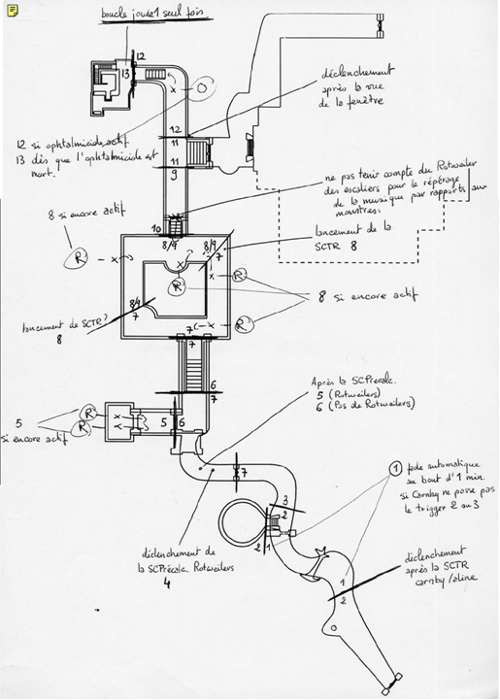 Figure 1: Composer Thierry Desseaux's top-down sketch for the musical structure of level one for the Carnby character of Alone in the Dark 4 (Darkworks/Infogrames 2001). Desseaux writes, "Every number corresponds to a marker placed in the music [here, Intro_C1, see figure 2]. These markers allow interactive variations of the music according to the place where the hero is or according to the contextual action. Letters symbolize monsters: R are for the rotweilers [sic] and O for the ophtalmicide." Retrieved from http://www.ldu-music.com/004_game_aitd.html, accessed March 28, 2010. 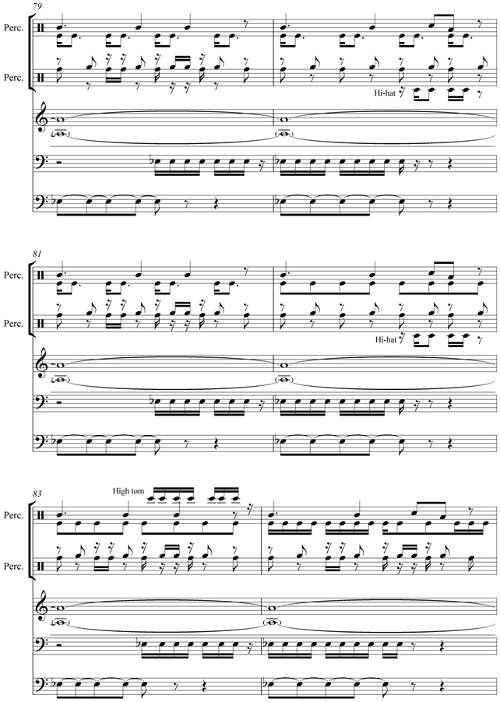 Figure 2: Cue from Alone in the Dark 4 (2001), transcribed from the game soundtrack provided on the composer's website. The letters are the author's designations. 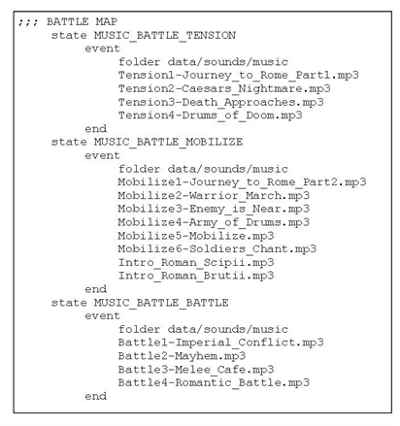 Figure 3: Code from Rome: Total War, "Roman Music"
1 I am indebted to Guido Heldt, under whose supervision the research presented here was conducted. 2 Kevin J. Donnelly, The Spectre of Sound: Music in Film and Television, London 2005. 3 Steven Poole, Trigger Happy: The Inner Life of Video Games, London 2000, p. 29–58. 4 J. C. Herz, Joystick Nation, London 1997, p. 24–31. 5 Stéphane Natkin, Video Games and Interactive Media: A Glimpse at New Digital Entertainment, trans. Eric Novak, Wellesley MA 2006, p. 1–14. 6 See also Bob Bates, Game Design, 2nd ed., Boston MA 2004, p. 39–95 for a genre-by-genre discussion of game design issues, and Ernest Adams and Andrew Rollings, Fundamentals of Game Design, Upper Saddle River NJ 2007, p. 433–669 for an in-depth examination of genre-specific game programming. Notable scholarly discussion of the video game genre includes James Newman, Videogames, London and New York 2004, p. 11–12; Mark J. P. Wolf, "Genre and the Video Game," in: Handbook of Computer Game Studies, ed. Joost Raessens and Jeffrey Goldstein, Cambridge MA and London 2005, p. 193–204; and Thomas H. Apperley, "Genre Studies," in: The Video Game Theory Reader, 2nd ed. Bernard Perron and Mark J. P. Wolf, New York 2009, p. 353–354. 7 Wolf, "Genre and the Video Game," p. 194 (see nt. 6). 8 Quoted in Matthew Belinkie, "Video Game Music: Not Just Kid Stuff," VGMusic.com, 1999; http://www.vgmusic.com/vgpaper.shtml (accessed April 9, 2009). 9 Paul Hoffert, Music for New Media: Composing for Videogames, Web Sites, Presentations, and other Interactive Media, Boston MA 2007, p. 16. 10 Hoffert, Music for New Media, p. 145–156 (see nt. 9); Alexander Brandon, Audio for Games: Planning, Process, and Production, Berkeley CA 2005, p. 195–201. 11 Aaron Marks, The Complete Guide to Game Audio for Composers, Musicians, Sound Designers, and Game Developers, 2nd ed., Burlington MA and Oxford 2009, p. 247, 299, 388. 12 Sean M. Zehnder and Scott D. Lipscomb, "The Role of Music in Video Games," in: Playing Video Games: Motives, Responses, and Consequences, ed. Peter Vorderer and Jennings Bryant, Mahwah NJ and London 2006, p. 241–258. 13 Karen Collins, Game Sound: An Introduction to the History, Theory, and Practice of Video Game Music and Sound Design, Cambridge MA 2008, p. 123. 14 Collins, Game Sound, p. 124 (see nt. 13). 15 James Paul Gee, What Video Games Have to Teach Us About Learning and Literacy, New York 2003, p. 23. 16 Gee, What Video Games Have to Teach Us (see nt. 15), p. 13. 17 Gee, What Video Games Have to Teach Us (see nt. 15), p. 19. 18 Gee, What Video Games Have to Teach Us (see nt. 15), p. 30. 19 Zach Whalen, "Case Study: Film Music vs. Game Music: The Case of Silent Hill," in: Music, Sound and Multimedia: From the Live to the Virtual, ed. Jamie Sexton, Edinburgh 2007, p. 69. 20 Following Collins (Game Sound), I define dynamic music as that which reacts to player activity and/or changes in the gameworld (see nt. 13). 21 For the moment , in order to skirt complex debates about narration in games, I follow Collins (Game Sound, see nt. 13) and Mark J. P. Wolf ("Space in the Video Game," in: The Medium of the Video Game, ed. Mark J. P. Wolf, Austin TX 2001, p. 51–75) and use the term "diegetic music" to refer to music that is perceived by the player as having a source within the constructed (fictional), character-inhabited game-world/space (Newman's "worlds," "lands," or "environments"' (Videogames, 108, see nt. 6), and "non-diegetic music" to refer to music that does not have an established origin in the game-world/space. 22 Particularly in games that employ a soundscaping effect, such as Alone in the Dark, game music can challenge the division between sound effects and music, often resulting in a kind of "musicalized sound." This indeterminacy can result in a musical score being interpreted as sound effects (diegetic) and vice versa: i.e., the transference of modes of listening (after Michel Chion, Audio-Vision: Sound on Screen, trans. Claudia Gorbman, New York 1994). It should thus be borne in mind that the player can apply musical hearing to sound effects (diegetic or non-diegetic) and that, similarly, musical elements may be heard as sound effects. In the case of short, non-diegetic musical excerpts used as communicative player-signals (musical sound effects), multiple modes of hearing may (apparently) be appropriate or even employed simultaneously. Of course, some genres, such as horror films and games, actively seek to blur such sonic boundaries as an unsettling and "horror-izing" strategy of categorical interstitiality/contradiction/incompleteness/formlessness (Noël Carroll, The Philosophy of Horror, New York and London 1990, p. 32). 23 See Whalen, "Film Music vs. Game Music" (see nt. 19). 24 See Karen Collins, "'Like Razors through Flesh': Hellraiser's Sound Design and Music," in: Terror Tracks: Music, Sound and Horror Cinema, ed. Philip Hayward, London 2009, p. 198–212. 25 Donnelly, Spectre, p. 106 (see nt. 2). 26 Kristine Jørgensen, "Left in the Dark: Playing Computer Games with the Sound Turned Off," in: From Pac-Man to Pop Music: Interactive Audio in Games and New Media, ed. Karen Collins, Aldershot 2008, p. 175.